I know nothing about mezcal but I’m not going to let a little detail like that stop me from reviewing one anyway. This particular mezcal is one that a lot of whisky geeks have been gushing about for some time now—it apparently has a smoky quality quite reminiscent of Islay whiskies. It also has going for it the fact that it’s a mezcal from a single village, Chichicapa. 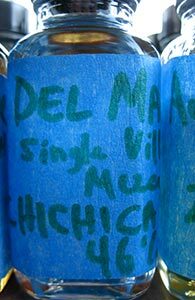 Indeed, the bottlers, Del Maguey, release a number of single village mezcals, some priced rather extravagantly. I’ve not quite been able to bring myself to pull the trigger on a bottle, as it runs north of $60 in most markets, but thanks to a sample swap I’m able to finally check it out. Nose: Nail polish remover at first and strong whiffs of gasoline. Then quite a lot of peppery fruit begins to appear: melon, grapefruit. Some floral notes too and then expanding lime (peel). After a bit it gets quite creamy and custardy. With more time the fruit gets quite intense. Not much change with water.